60 years after Martin Luther King visited this place to learn about the ways and influences of Mahatma Gandhi who started a resistance movement with the tool of non violence, the delegation of top cops and former police officers from the US visited the famous Mani Bhavan, which was the head quarter of Mahatma Gandhi’ activities during India’s freedom struggle. 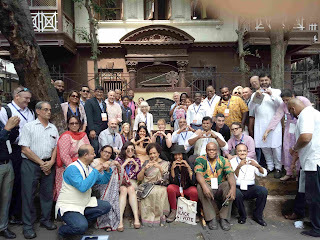 “(The visit) presents a unique and important opportunity to explore Gandh’s principles of nonviolence and work with police and community leaders to counter violence and extremism,” Chief (Ret.) Jim Bueermann, President of the National Police Foundation said while interacting with media here. The delegation is touring Mumbai from the 28th to 30th of September, and will learn about Indian spiritual wisdom and techniques like Meditation and Sudarshan Kriya. In the second leg of the trip, marking Mahatma Gandhi's 149th Birth Anniversary, the delegation will come together to brainstorm solutions to modern day conflicts through Gandhian principles of Non-Violence at the Art of Living International Center in Bangalore. The conference is all set to play host to the likes of Dr. Frank Straub, and Dean Esserman from the National Police Foundation, Dr. Makarand Paranjpe, Director, Indian Institute of Advanced Studies, Dr. Joseph Smith, Mayor of North Miami, Charlie Allen, Institute for Economics and Peace and other lawmakers, peacekeepers, researchers and thought leaders. The forum’s interesting line-up of sessions features discussions on topics such as ‘Making Peace Profitable,’ ‘Foundations of Peace and Non Violence in India’s culture,’ ‘Creating Positive Peace Frameworks’ and includes a Masterclass in Non Violence with Gurudev Sri Sri Ravi Shankar, founder of The Art of Living and International Association for Human Values, known for his role in brokering the historic peace deal between FARC and the Colombian Government.